The past week has been crazy, and unfortunately the crazy spilled into the weekend as well. I had visions of the perfect thought-provoking topic for this week’s Curbside Consult, but every time I tried to flesh something out, it escaped me. Instead, I found myself musing on what I planned to do at HIMSS and which vendors I wanted to be sure to check out. Mr. H and Inga are hard at work on their “must see” vendor list and I’m working on my personal CMIO hit list. For the CMIO (or anyone involved in evaluating new products or making purchasing decisions) it can be a great way to sort the proverbial wheat from the chaff. Many products look great in brochures or on the Internet but pale when you see them in person. Last year one of my “hot items” (sad that I think this is hot, isn’t it?) was wall-mount swing-arm brackets for monitors. The true test of quality and sturdiness is being able to check them out in person rather than trust a marketing slick. You may ask, why does a CMIO care about brackets, and should she? The answer is yes. If I have to use it every day, I want to make sure it’s going to work for me and for the hundreds of physicians I represent. That’s not to say that the CMIO should be out personally investigating everything that needs to be purchased. Generally I prefer that the engineering and purchasing folks work their magic first, culling the herd down to their top choices, then allow a small group of providers to make the final call. This year I have a laundry list of things to look at. Some are a bit gadgety (washable keyboards, COWs), others are more esoteric. I want to see how vendors are progressing with natural language processing and where they stand with clinical decision support. Are they going home-grown, or incorporating third-party solutions? How are the attendees responding to them? Who has incorporated Medicomp’s Quippe product that blew our minds at HIMSS11? Like last year, I hope to have some time to cruise the exhibit hall with Inga, but I will also have some time to peruse the booths with a few other CMIOs and share their opinions and thoughts. One of my friends is a first-time attendee, so watching his expression as he sees some of the people out there will be interesting. A note to ChipSoft: I see you’re exhibiting again. If you’re giving away the clog slippers this year, please stash some for Inga and me because we’ll be looking for them and you ran out last year. The marketing materials from exhibitors are arriving much more slowly than I remember from last year. 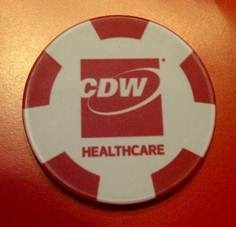 So far, my favorite marketing piece is from CDW Healthcare, with their “What happens at HIMSS definitely won’t stay at HIMSS” tagline and accompanying poker chip. Although I like the idea of taking home things I learn, based on the potential for Inga and Jayne to have a good time, I’m sure some things will be staying well within the 89109 zip code. Just a quick comment to say I thoroughly enjoy your commitment to giving your readers a well-balanced education. Not just what’s up in healthcare, but why CL shoes have their distinctive red sole! A mundane process turned into a brilliant marketing differentiator. I’ll be looking out for them! Red outsoles are a commonly used ornamental design feature in footwear, dating as far back as the red shoes worn by King Louis XIV in the 1600s and the ruby red shoes that carried Dorothy home in The Wizard of Oz. There’s your fashion moment of the day, and hopefully some of you can leverage this newfound knowledge to win the hearts of your lady-friends who might have a thing for shoes, not to mention to triumph in the next battle of the sexes trivia night. Have a favorite HIMSS (or other show-related marketing piece) to share? Does it belong in the Hall of Fame or Hall of Shame? E-mail me.